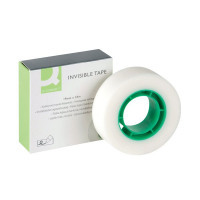 This Q-Connect invisible tape is ideal for mending tears and wrapping packages. It can be written on, typed on, photocopied and faxed, all without leaving a ghost mark. This pack contains 1 roll of tape measuring 19mm x 33m.